A domain name is the link between your website and its visitors. Each domain name is unique within each of the "Top Level Domain" areas. For example, .com, .org, .net, and .us. Choosing your domain name is the first step in getting you and your website introduced to the internet "community". 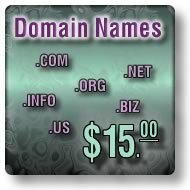 MMSHosting provides you with a set of easy tools and an order process that makes getting your domain name a snap in any of the following TLDs: .com, .net, .org, .us, .info, .biz. We provide you a complete domain registration service, whether you want a single year or a multiple year registration. You can also transfer an existing domain to our domain services for a one time fee of $12.00. This fee will normally include an additional year being added to your domain renewal date. Use our domain search tool to check the availability of your name in the TLD of your choice. Having difficulty coming up with the right name? Use the Wizard to help find that special name. You can transfer you domain to our domain registrar during your order process. Just select the option to "transfer my domain" and we will start the transfer request. You should note that domain transfers can be denied by your current registrar or your administrative contact. To ensure a successful transfer, be sure your registrar will allow the transfer and your administrative contact for your domain is aware that a transfer request will be started. Depending on how your domain was setup, the administrative contact could (should) be yourself. If you have any question regarding this process, please contact our sales department for assistance sales@MMSHosting.com.